After spending time on the island of Sardinia all Caprese salads have failed to meet the gourmet tastes that my taste buds met there. I thought I might never again taste the amazing flavors of the fresh mozzarella, and then we returned to Italy, to my husband’s families farm. Any guesses as to what they make? Fresh Mozzarella! Caprese salads need to be lovingly made and made only with the freshest and finest ingredients. The most decadent salads will have the summer’s best produce involved and will be just plain good. Caprese salads are not all made equal. Restaurants offer these salads but never get them right and we have dined in the best to the worst and have found nothing that even compares to what we know. Caprese salad tips will walk you through the tips and tricks of creating the freshest and best tasting Caprese salad you can enjoy, even if the best of produce is not available in your area. We were in a restaurant recently and the chef brought us a salad, and we just were agreeable to make him feel good, but it had no taste. I am not sure how old the cheese was, or why the basil was brown, nor was I understanding of why the tomatoes were plain mush. It was awful, but as his guest, there was simply no way to insult him. Good Caprese salads are not about THICK cheese, rather evenly sliced cheese that meets the tomato thickness. Traditional Caprese salads are tomato slices followed by cheese, followed by tomato, etc. Fresh spins on Caprese salads are using small balls of fresh mozzarella and leaving with small tomatoes, and shredded basil. Other forms of Caprese salads are chunked up tomatoes, with a larger portion of fresh moz on the top and basil leaves throughout. As you can tell the options are endless, Caprese to each person is different, which form will you claim? The other day I was in the store, and I had the option to buy basil in a package or a fresh basil plant. Want to guess what I bought? The plant of course, because fresh is as fresh does. The ability to simply wipe the leaf off, and place it right onto the salad makes is super fresh and home-grown right in my kitchen!. If you are using leaves that are already in a container, wipe the basil leaf with a damp paper towel to cleanse rather than rinse. You can leave the leaves whole, or shred them or mince them, truly all about the taste and the presentation, so get creative. Ripping looks good as well. Don’t forget there are different colors of basil if you are really into this whole creative thing, check out purple basil! Tomato tastes are where we all differ. I always go for the tomato that has lovely outer color, yet is firmer, because squash against squish (cheese against tomato) is too much in the mushy stuff department and lacks texture! A riper tomato can mean a tomato that is too soft to be enjoyed. I also look for a tad firmer tomato that is on its way to ripe but is NOT there yet. Slice the tomato in uniform slices. Truth be told, that some of the summer’s sweetest tomatoes do quite well as red, plump and juicy truly offers a sweet taste to the cheese, but do not go squishy on any account. My preference as served in Sardinia is towards the Roma tomato. Roma tomatoes are perfection with Caprese salads because they are pretty darn close to the size of the fresh mozzarella when cut. Heirloom tomatoes take the Caprese salad to the next level they are more seasonal and harder to find, making them a tad less popular. Please don’t sprinkle sugar on these tomatoes, you are ruining the natural taste. Grape tomatoes work best with those little balls of mozzarella and if you are doing a trifecta of tomatoes on a platter. Do not use them if you are doing a regular platter, with large tomatoes as you will not yield the taste you are after. Presentation adds life to the salad, that said, find yourself a great looking platter and settle for nothing less than colorful! You are unfortunately victim to whatever the local stores in your area carry for fresh mozzarella. That said, you can still create a joyful jumble of fresh tastes that will carry an assault of richness and flavor. If you can only find the small balls in water, buy them, drain them and then cut them into pieces and do the same with the tomato, making more of a salad. It would follow then to shred the basil as well. Serve this in a bowl. Large chunks of fresh mozzarella should be drained, and sliced uniformly. Perhaps this is your first try at slicing and preparing Caprese salad, then look for packages that are marked with pre-sliced but not sliced. Try to find fresh mozzarella that offers ‘slice’ marks so it is easier to get those slices perfect. This gets the thickness just right, and then match that to the tomato slice. Please use Extra Virgin Olive Oil, the best you can afford, and it needs to be dotted, not drizzled, remember all the flavors already are there, you are accenting. Use Balsamic GLAZE not balsamic. 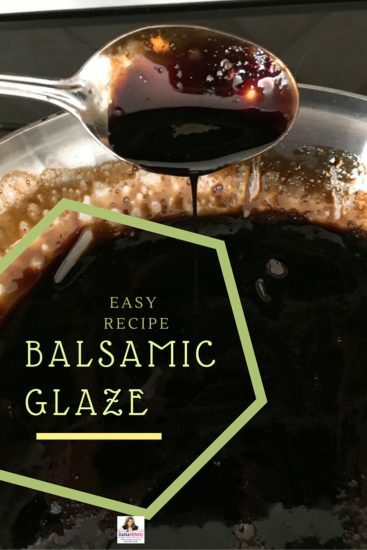 My recipe for Balsamic Glaze is easy and fast. Mediterranean coarse salt, freshly milled is perfection, accompanied by freshly milled peppercorns. Do err on the light side of pepper. Simple and delicious, yet sure to please even the most finicky gourmet eater, the Caprese salad is an awesome stand alone meal, or side, or aperitif, depending on the crowd you are serving. Lavishly live food out loud, and use my Caprese salad tips to create a delicious trifecta of flavors! Tomatoes, fresh basil, cheeeese, what could be better? This post is a salad lover’s dream. Will share on Facebook! I don’t eat salads too much, but my wife does and she would love this. I will definitely recommend her to your blog. I love the color of tomato. I haven’t seen that kind of tomato all my life. I only know Caesar and garden salad. This is the first time I was introduced to this salad and I want to have that on my plate right now. My girlfriend simply adores salads! I didn’t think it was so easy to make one. I wanna impress her by making one. I hope I can replicate this one properly for her! I think I can make that. Instructions are easy enough to follow. Ingredients are easy enough to find. The platters though, I’m gonna have to improvise. LOL! Just love salads! Thank you for the share! I already tried your shrimp caprese sandwich and it was divine. Now I’m gonna make sure to try caprese salad as well. Thanks for all this wonderful tips! it’s interesting to know that there are so many variation of caprese salad. you just made it simply different, yet tempting. the last one I had, they use different dressing on it, but i’m eager to try your way, looks differently tempting. I am not into salads so I am not very much aware what are the types of salads and what are their ingredients. I’ll probably be one of those people who you give a salad to and will be perfectly happy even if the ingredients are not top notch. Anyway, Caprese salad looks good! I’m drooling just looking at the photo. The picture itself is tempting me to try it out. Very healthy ingredients and I am glad you finally found the right ingredients from your husband’s farm itself. Even though we will be able to dine certain dishes at a restaurant nothing comes like making in the home and tasting that same dish with our loved ones. The preparation itself will come along with lots of love, making it super delicious. Thanks for sharing. Oh my god, such an amazing salad and have never heard about this before. The picture looks amazing. Yeah, I agree restaurants are not good in making every food delicious and some dishes needs more fresh ingredients like you said. I am sure the delicious taste of Caprese salad is because of the fresh ingredients which are got from your husband’s farm. Thanks for the article. I like the names of salads. Like this is my first time ever hearing this kind of salad. Though they are most veggies, I think they are worth a try. Looks delicious! Thanks for sharing the tips! I love salad with THICK cheese! Thanks for writing this! OMG this is the perfect article to start my weekday. I never tried Caprese salad before but I will! I agree that it’s hard to find a place with good salad so I try to make my own. Thank you for sharing this. I hate vegetables I really do However this is so enticing that I may give it a go if it was on my table. Just how many salads are there? I mean come on!!! but at this point I am not surprise. It looks delicious. Looks like a pretty simple salad but the way you outlined the ingredients makes it a five-star dining experience. Fresh is best, no doubt about it. But sometimes we take salads for granted because it’s not the main course so we kinda get used to so-so stuff. I love your passion Dana! I love the details Dana! This is why I love reading your blog about food because you will always settle for nothing but the best ingredients and ways to prepare even the simplest food. Cheers! Carla, thank you so much for writing that really nice compliment. You made my night. I do believe in the best of the best:) DANA. thanks for being a fan and reader of my site.